The foundation of HSB summer camps. With basketball camps in Texas, Idaho, Washington, Oregon, Utah, and Wyoming, HSB camps have become a popular choice for players throughout the western U.S. Regardless of your skill or experience level, they have a unique program perfect for your young players. Their Morning Clinics are designed for boys and girls in elementary school with a focus on fundamental skill instruction, contests, and organized team competitions. Their Day Camps are geared toward boys and girls in upper elementary, middle school, and high school. Fundamental drills are still a big part of the curriculum, and players get a chance to work one-on-one with pro players and coaches. What intrigues me most about this camp is their heart. HSB camps have a unique philosophy when it comes to serving kids. 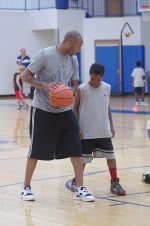 Their commitment to providing exceptional basketball training to players of all ages, abilities, and incomes permeates everything they do. Starting with camp fees...They price their camp sessions by the hour, so their camps end up costing about $10/hour plus a registration fee. I would certainly say that’s a great value. Registration payments can be paid in installments, and they offer discounts and scholarships for those who need them. Anyone needing financial assistance can find a form online to submit a scholarship request. They claim they have not turned any camper away for an inability to pay. HSBCARES...$5.00 of each camp registration is donated to their HSBCARES fund, a non-profit organization which provides camp scholarships for those in need and the purchase of training equipment for local youth basketball programs. To date, they claim to have raised more than $50,000. What else makes HSB Camps unique? And if you really like their summer camps, they offer Saturday sessions and mini-camps throughout the year in some locations. They even have a club team, Havoc Nation, for those who really want to elevate their game. Click here for more information about HSB camps.